Are you ready to 'Flow Through Space'? 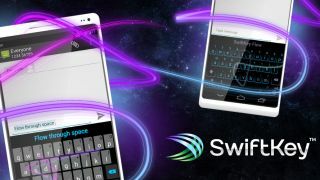 The popular SwiftKey application which offers up a clever and highly accurate typing solution has added another string to its bow in the form of SwiftKey Flow. Now in its fourth iteration SwiftKey users can now take advantage of the swiping feature we've seen on other Android keyboards, allowing for a fluid input style which requires the use of a single thumb - perfect for one handed manipulation. It's not your standard swiping action however, as SwiftKey has taken it one step further with its "Flow Through Space" feature, allowing you to input a continuous string of words by swiping your finger over the space bar between each one. For anyone who hasn't experienced gesture typing yet SwiftKey Flow may feel rather alien and tricky to master as it's a very different way of bashing out your missives. It does require you to spend some time with the system, to learn how it works and allowing it to fine tune its prediction engine to suit your style of writing and vocabulary. Don't worry if all this gesturing business isn't your cup of tea as SwiftKey 4 still offers up its normal keyboard and next word prediction technology in the standard format, which has made it a firm favourite here at TechRadar. The prediction engine, word correction facility and language options have also been given a boost in a bid to offer a more accurate and quicker input method. Believe it or not, but SwiftKey was the best-selling paid-for app in Google Play in 2012 - now that's quite an achievement considering a keyboard managed to beat off the likes of the ever popular Angry Birds and co. If you fancy taking the plunge then SwiftKey 4 is available over on Google Play, although it will set you back £1.49 on Android smartphones and £2.99 for those plumping for the Android tablet option - with both prices set to rise after a promotional period.